Train Nos. 4-46 and 5-47, The Sportsman, made its inaugural trip on March 30, 1930, on a somewhat different route for the Chesapeake and Ohio. It ran primarily between Newport News and Detroit, but with a good connection to Washington, D.C.
F-16 No. 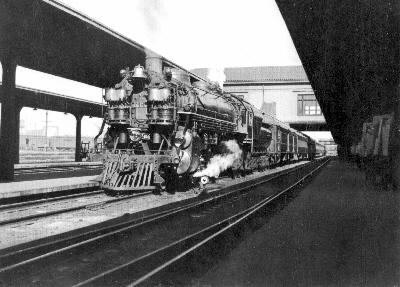 464 leads The Sportsman at Columbus Union Station ca 1935. Photo courtesy of Chesapeake and Ohio Historical Society. 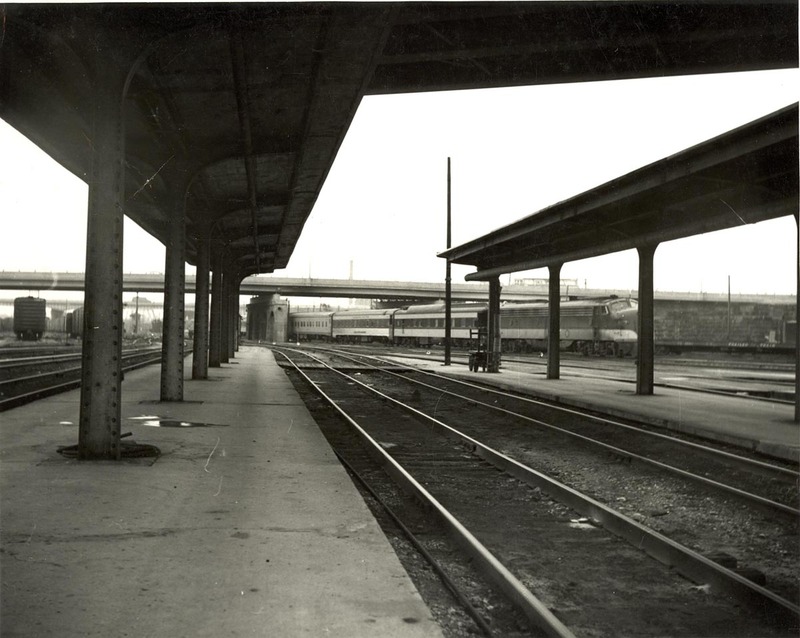 Its equipment included a combination baggage and smoking car, imperial salon coaches, a standard dining car (east of Ashland), a club dining car (west of Ashland), sleepers and an observation/lounge car. The club diners, numbered 90 and 91 and lettered Hocking Valley, had a section for dining that seated 24 and a lounge section that seated 14. The dining room chairs were designed after those in New York's Ritz-Carlton Hotel's restaurant. The exposed woodwork on the chairs was finished in gold with black striping, and the leather upholstery was either red, gold or blue with eight of each. When distributed randomly in the dining area, they produced an effect of richness. The imperial salon coaches had a single row of seats on one side and a double row of seats on the other side of the car. The seats sold at the same prices as standard coach rates, but rivaled parlor seats in comfort and room. The observation/lounge car had a radio installation - a first on the C&O. The original locomotives for the train consisted of five heavy Pacifics, class F-19, and numbered 490-494. They had been built by Richmond in 1926. For inauguration of The Sportsman, the locomotives were shopped and given polished cylinder and valve head covers, polished air pump jackets and embossed eagles on the feedwater heaters. 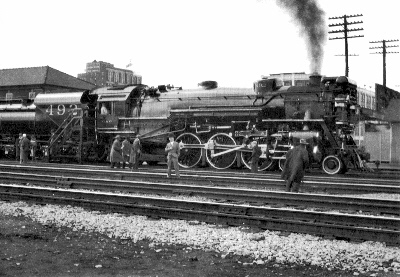 F-19 492 at Huntington, WV March, 1930, during The Sportsman's pre-inaugural tour. Photo courtesy of Chesapeake and Ohio Historical Society. The F-19 Pacifics were used to inaugurate The George Washington in 1932. 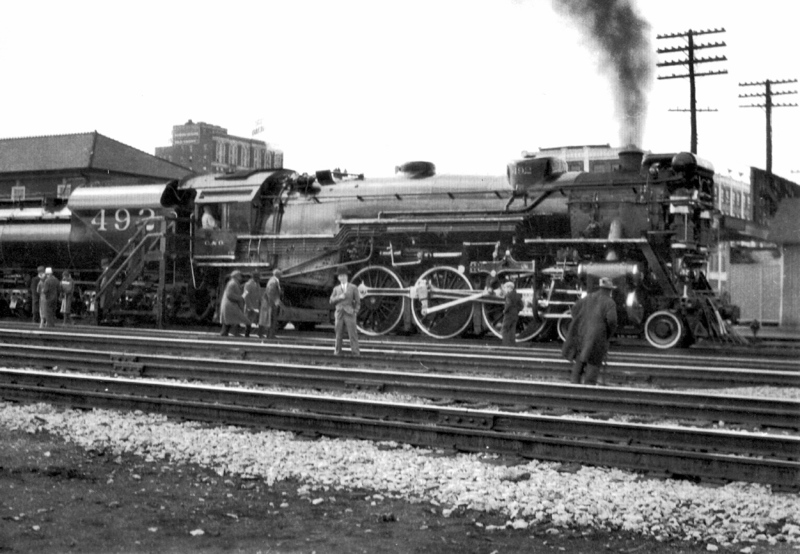 Over the years, the Pacifics used to power The Sportsman included most of the classes of that type of locomotive owned by the C&O in the 1930's and 1940's. The Pullman-Standard order for lightweight passenger equipment that arrived in 1950 became the backbone of the C&O passenger fleet until the Amtrak takeover on May 1, 1971. While some cars were sold before delivery, the C&O kept 59 coaches, four buffet-lounge-observation cars (one was converted into office car 29), 43 10-6 sleepers and five double bedroom sleepers. The coaches seated 52 with a center divider. The buffet-lounge-observation cars became diner-dormitory cars. The 10-6 sleepers had the bedrooms in the middle and the roomettes at the ends. Since no diners were retained, many trains carried heavyweight diners. Dieselization of the C&O's passenger service occurred as 27 EMD E-8's were delivered between August 1951, and January 1952. The use of steam locomotives in passenger service essentially ended during 1952. Four more E-8's arrived in May 1953. Train 46, The Sportsman at Ivy, VA, September 1958, with E-8 4003. Photo by Gene Huddleston, courtesy of Chesapeake and Ohio Historical Society. Union Station in Columbus was on the Pennsylvania Railroad, but not on the C&O. In order for C&O trains to reach it, if a train was coming from the east (south), the operator at LM Tower would head it into Yard A and a switchtender would let it onto the PRR. On leaving Union Station, a C&O train heading west (north) would back out of Union Station, through Yard A and onto the C&O main. Trains backing out expected a passable signal at the lead to the PRR transfer located immediately south of LM Tower on No. 2 Track. For an eastbound train such as No. 46 the whole process was reversed. The train stopped when clear of the lead to Yard A, and backed into Union Station. 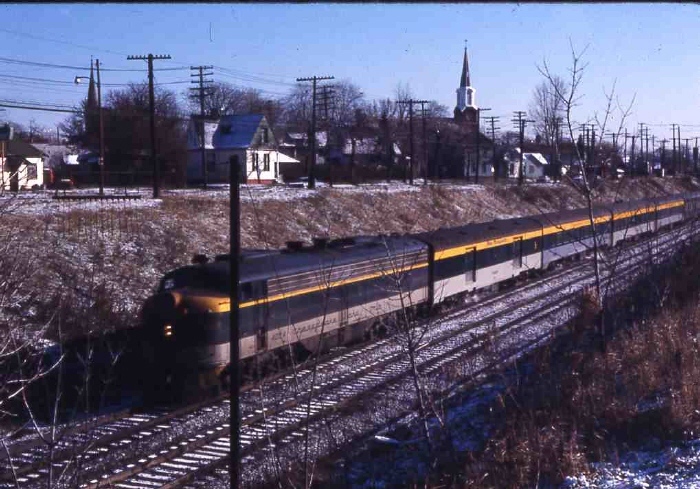 At some point in about 1968, the C&O decided to cut off the switchtender's position and have Nos. 46 and 47 use the PRR transfer to get to Union Station. Therefore, the whole process was reversed. No. 47 would come up No.2 track and head into the PRR transfer using 88 or 90 track as lined by the operator at LM. The operator would reverse a crossover, and No. 47 would back into Union Station. No. 46 did the same thing, but with the train direction reversed. One evening in about 1968 or 1969, the operator (Pat Rose) at LM came on the dispatcher's line and in as calm a voice as possible announced "The Sport is on the ground." It had derailed something while in 88 or 90 track. Action to rerail whatever was off the track came swiftly. It was the only known derailment of The Sportsman on the former Hocking Valley. 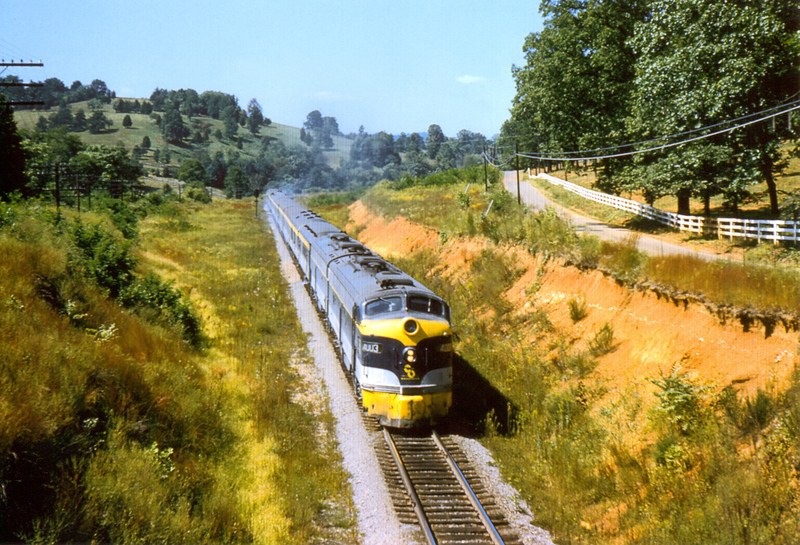 April 29, 1962 The Sportsman was discontinued east of Ashland and consolidated with The Fast Flying Virginian in that territory, but the schedule was better since No. 47 left Columbus around 7:30 a.m. After The F.F.V. made its last run on May 11, 1968, The Sportsman was consolidated with The George Washington. The Sportsman was cut back to just three days per week (Friday, Saturday and Sunday) effective August 2, 1970. By this time, it was running as an E-8, a food bar coach, and a P-S deluxe coach. It made its last run on April 30, 1971. Train 47 just west of Toledo Central Union Station with E-8 4004, a baggage car, two coaches, a dorm/dinner,a B&O sleeper and a PRR sleeper (Jefferson County). Photo taken on November 15, 1967 by the author. Published by The Chesapeake & Ohio Historical Society, Inc.